The Certified Digital Marketing Professional course is ideal for anyone involved in the planning, implementation or measurement of digital strategies – or anyone who would like to pursue a career in this area. If you are a business owner, marketing professional or manager who wants to improve your online engagement, this is the course for you. This 5-day course (30 hours of classroom training) is exclusively designed by the Digital Marketing Institute in Ireland and is approved by NIMA (Nederlands Instituut voor Marketing) and the Global Industry Advisory Council. The Global Industry Advisory Council, representing the world’s largest and most influential digital brands (including Twitter, Facebook, Google, LinkedIn, Microsoft and IBM), validates all course content. By providing expert review and recommendations on a regular basis, the Council ensures that graduates of this course have learned the most up to date digital skills, core competencies and knowledge needed to thrive in their digital careers. Delivered by industry experts, you will be introduced to the most relevant and transformative aspects of digital. See tabs below for details. After successful completion of the official certification exam, you will receive the Certified Digital Marketing Professional certificate. This examination is hosted by Pearson VUE test centres and is included in the course price. If applicable, you will also receive 30 NIMA PE points on the NIMA MyCareer portal. Please see the tab ‘Exam information’ for additional information. Stay current. Stay relevant. Get connected with… DMI Membership. Being a successful digital professional can be a challenge; keeping up with trends, driving effective campaigns, generating high-quality leads. 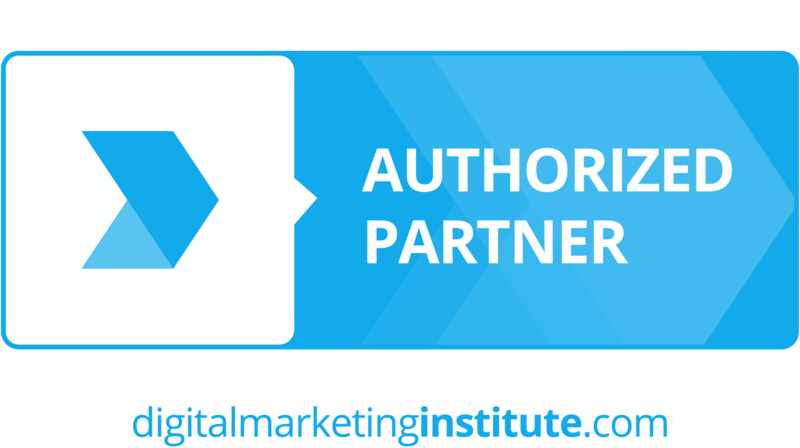 The membership platform of the Digital Marketing Institute offers you a way to do all of that in one place and this 1 year membership is included in the course fee. See tab ‘DMI Membership’ for detailed information. This course is taught in English. Download the brochure of this course. The Certified Digital Marketing Professional course is ideal for anyone involved in the planning, implementation or measurement of digital strategies – or anyone who would like to pursue a career in this area. If you are a business owner, marketing professional or manager who wants to improve your online engagement, this is the course for you. This digital marketing training will provide you with everything you need to kickstart an exciting, innovative career. The Certified Digital Marketing Professional course has been credit rated by SQA at Level 8 on the Scottish Credit and Qualifications Framework (SCQF). SCQF level 8 corresponds to level 5 (HBO) on the European Qualifications Framework (EQF). To complete the course and become a Certified Digital Marketing Professional, you will have to complete a computer-based examination. The exam is included in the course price (students will receive a voucher) and can be scheduled at your own convenience at any Pearson VUE testing centre throughout the world. Candidates must take the exam within 24 weeks of completing the course. We recommend students take the first exam 3-6 weeks after the completion of the course. This website of Digital Marketing Institute is dedicated to candidates preparing for the computer-based exam. The full exam guidelines you will find via this link. Stay current. Stay relevant. Get connected with… DMI Membership. Being a successful digital professional can be a challenge; keeping up with trends, driving effective campaigns, generating high-quality leads. The membership platform of the Digital Marketing Institute offers you a way to do all of that in one place and this 1 year membership is included in the course fee (normal price € 249,-). 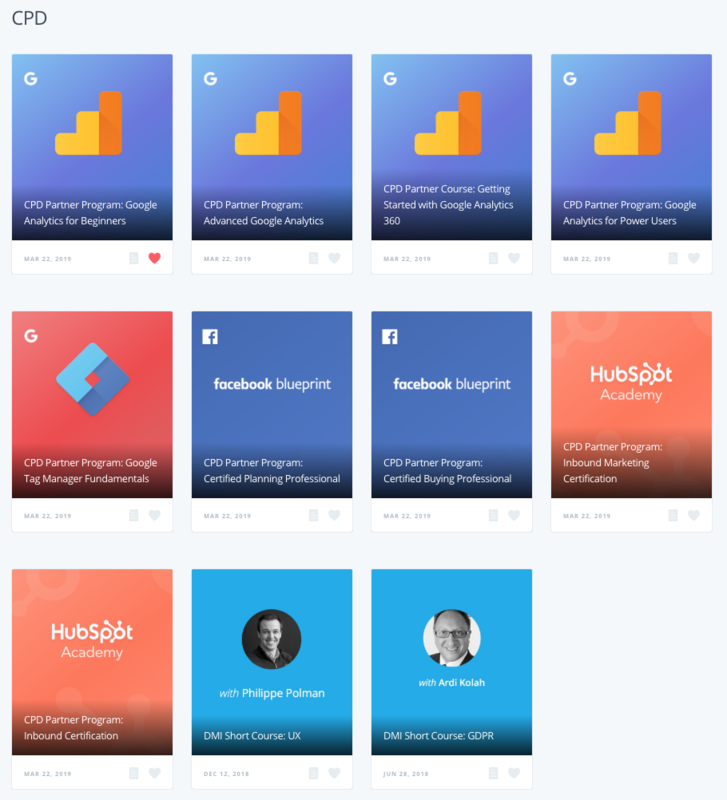 As part of your CPD program in the Membership portal, you can take online courses of DMI partners like Google, Facebook and Hubspot. Once you have completed a course, you can then claim up CPD Credits for each course you completed. For more information and free trial visit the website of the Digital Marketing Institute. What do our attendees say? Super training, very interesting stuff. Enough details, but not too many. Link with actual systems: so you see the theory applied into f.i. Google Adwords, live. From 10:00 to 17:00 incl. break. Price includes official certification exam and one year Digital Marketing Institute membership with access to education portal. incl. lesson materials, lunch, coffee/tea and attendance certificat. All CMM courses are free of VAT. 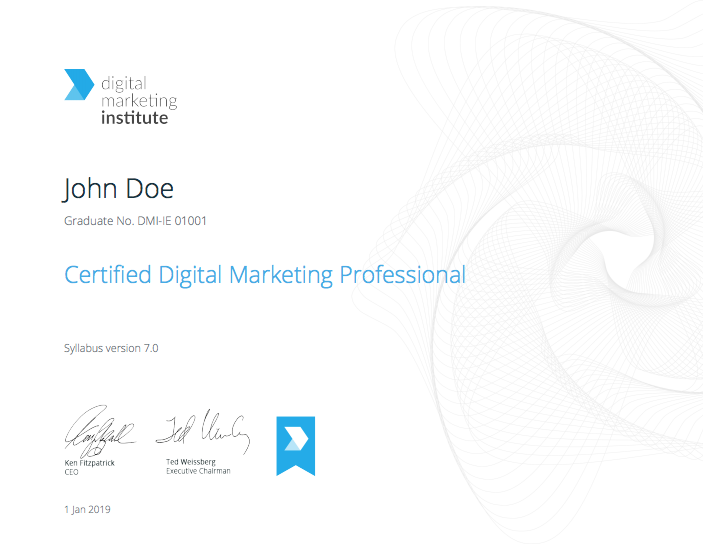 Interested in the Certified Digital Marketing Professional course?